Yes, many a morning spent watching Captain Kangaroo embedded that particular line of verse into my subconscious forever and ever. It was a cartoon short they used to play on the show that has stuck with me all these years, and resurfaces every now and again. 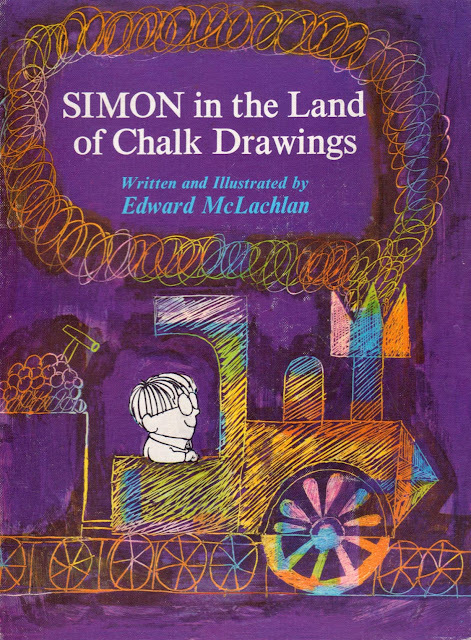 Simon in the Land of Chalk Drawings was a British children's animated television program, featuring the adventures of a young child named Simon, who has a magic chalkboard. Things that Simon draws upon the chalkboard become real in "The Land of Chalk Drawings", which Simon can enter by climbing over a fence near his home with a ladder, interacting with his chalk drawings, including his chalk-drawn friend Henry. 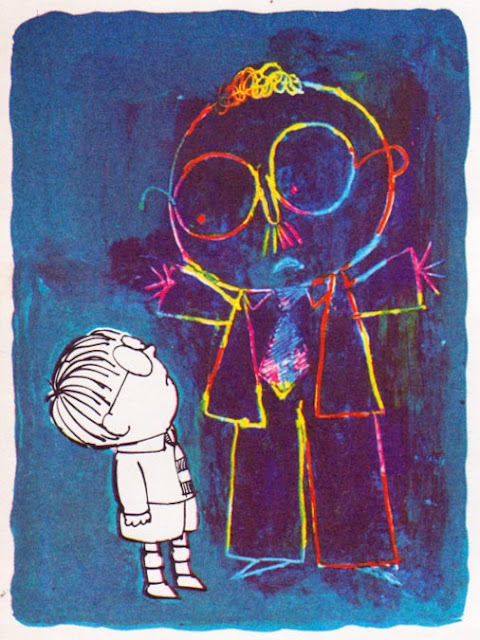 Stories often revolve around the unintended effects that Simon's drawings have on the Land of Chalk Drawings, such as when an upset Simon draws a picture of his angry self, which proceeds to go on a rampage. The program is based upon the writings of Edward McLachlan. It was produced in the early by FilmFair Productions in London for Thames Television, and was originally a 5 minute program, broadcast around tea time in Britain. The program also became familiar to American audiences in the mid 1970s when it was featured on Captain Kangaroo (where it was narrated by Bob Keeshan instead of Bernard Cribbins). The programme is based upon the writings of Edward McLachlan. A few more Google searches and $40 later, I am holding this little angel in my hand. Apparently, the cartoon series was based on a book. Simon loved to draw. He would have liked to draw all the time, and occasionally he would even draw on the fence on his way to school. But he never finished anything he did. One morning on his way to school he found a strange figure waiting for him beside the fence. "Why, you're the drawing I did yesterday," said Simon. "Yes," replied the drawing, "and if you will be so kind as to complete me, I would like to take you somewhere." 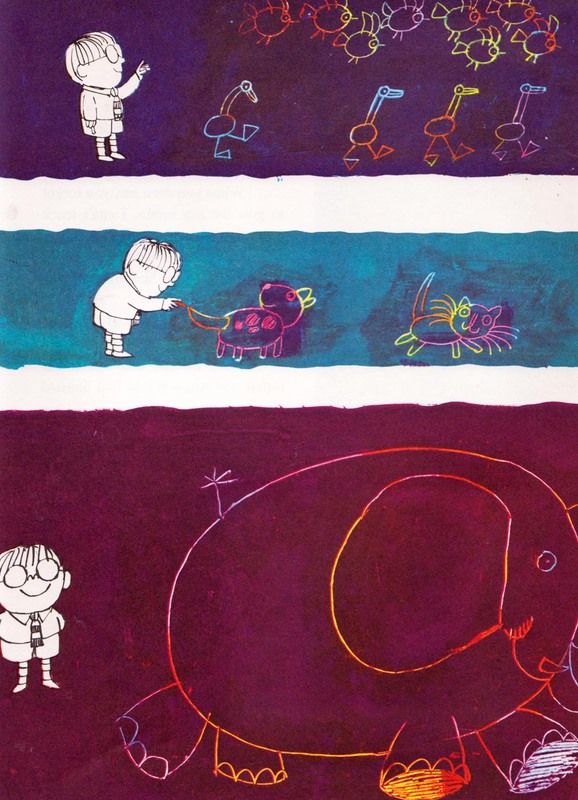 Simon took a piece of chalk out of his pocket and gave the figure another ear, and eye, and arm. "Thank you," said the drawing and beckoned Simon to follow his. This is so much fun, thought Simon. Much better than school. So Simon finds himself up and over the fence and into the Land of Chalk Drawings. A place where everyone is miserable because Simon only half drew everything. Upon finding a train with no track, he draws more. A mess of animals missing tails and whiskers and ears and feet, he quickly makes them whole. A teacher without any books, though when he makes that situation right and the teacher begins a lesson, he immediately wishes he hadn't. 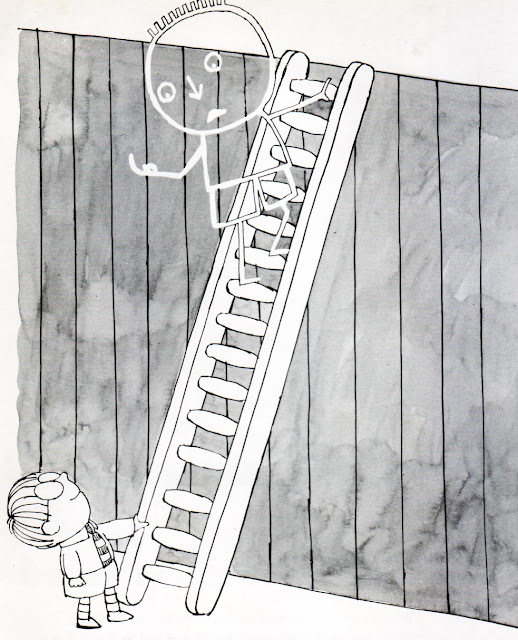 Eventually, Simon sets right all he had half finished, and worried that he'll be late to school, climbs back over the fence and promises to come back again. And apparently he did. Fourteen episodic times. He even showed up as a Mike Myers spoof decades later on Saturday Night Live, and now apparently has a new version that is showing on some channel or another. I won't dare have a look for fear that it sully my childhood memories of awesome. Good times friends. Good times. I never knew there was a book, either! Love the art! Captain Kangaroo was still on when I was little (I was born in '77), but I watched "Simon" on Pinwheel on Nickelodeon! I had no idea there was a book. This is fabulous! Love it! I remember the show, I will have to try to find it on YouTube for my daughters! And I had totally forgotten about that SNL spoof, haha! I don't remember this on Captain Kangaroo, but I do remember it on Romper Room. It was always my favorite part of the show. Wow! This looks like a great book; I had never heard of it. I can see this would really appeal to children who like to draw...and to children with active imaginations...well then, to all children! It reminds me of the "Harold and the Purple Crayon" by Crockett Johnson. I think the Harold stories were also animated. This looks like a book I need to add to my collection. Hmm... I see a need for an OMNIBUS by one of those new publishers! Aaaawwww, Simon in the Land of Chalk Drawings! I was born in '73, so I was lucky enough to watch Captain Kangaroo regularly. I adored that show! And I especially liked the Simon cartoons when they showed them, and I never forgot about them. In fact, that song is playing merrily in my head right now after reading this great post! Thanks so much for sharing this! Google brought me here, and I have to say, I remember this!!! Great Holiday Give: Day Five ~ Grab Bags Galore! Great Holiday Give: Day Two ~ Pippi Moves In!